Transform your child's bedroom with these fun decorations. Removable wall stickers are easy to put on and peel off. Or go for a space theme with glow in the dark stars and solar system planets. Delightful and inspirational fabric wall stickers! fabulous London themed wall stickers! Space themed fabric wall stickers! Owl and the Pussycat fabric wall stickers! Fabric Star themed wall stickers! Fun polka dot fabric wall stickers! 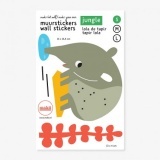 Jungle creatures shaped wall sticker!